RapidRun to be used in virtually any installation requiring 4K/Ultra HD (UHD) extension. 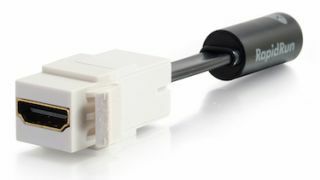 On display at InfoComm 2016, the new RapidRun Optical solution includes the line’s hallmark modular options of break-away flying leads and wall plates that attach onto the appropriate length runner cable, providing all the install cost and time savings of RapidRun with the additional high performance needed to carry today's 4K/UHD 4:4:4 signal up to 1,000 feet. The fiber-based solution features 18 Gbps bandwidth, a diameter of just a half inch, a 5mm bend radius and OFNP (plenum) rating—delivering the sufficient bandwidth and flexibility needed to enable an effortless installation serving the AV needs of commercial applications for years to come. The new RapidRun Optical HDMI extender is available now.